Today, “turtle fishing” has a whole new meaning. Catching sea turtles for food is outlawed in the U.S., and marine scientists are casting their nets for new knowledge to help conserve these endangered reptiles, combining state-of-the-art research with a fisherman's perseverance and patience. Research on the water can involve long days of tedious waiting and countless pesky disruptions, from Hurricane Charley and “Superstorm” Sandy to stingray barbs, red tides and sunburn. These challenges are all part of a research and conservation effort unfolding in the murky waters amid mangrove islands along southwest Florida's coast, where scientists from Mote Marine Laboratory and the Conservancy of Southwest Florida study one of the rarest sea turtle species on Earth. Our “turtle fishing” involves catching Kemp's ridley sea turtles to tag them for identification, take measurements, collect biological samples and return the turtles to the wild. Through this research, we are shedding new light on their ecology, feeding habits and habitat requirements to inform management and conservation. We depart early aboard the R/V McQueggie in Charlotte Harbor National Estuary. We hope for a glassy morning with no wind and gentle, sparkling surface ripples, but instead we find sea fog so thick that a GPS becomes the only reliable guide. We listen intently for a distant whuff from a turtle breathing at the surface. We hear muffled splashes, perhaps from mullet jumping, eagle rays leaping, or silver tarpon that arcing and crashing back into the green water. The fog dissipates and we scan the horizon as hours pass. We watch a local fisherman circle around a school of mullet to herd the fish together before casting his net. We see a bald eagle harassing an osprey until it drops a mullet, which the eagle swoops in to steal. Depending on the season, our field sightings may include a school of menhaden, a raft of drifting jellyfish, or a small blacktip shark zipping just beneath the surface. We sometimes see dolphins mill about and breach for a few seconds before disappearing. We wait and watch for the pale head of a Kemp's ridley to surface, and we pass the time by reciting classic Monty Python skits, musing about sea turtles and sharing science gossip sprinkled with new insights and bad puns. All the while, our gazes remain riveted just below the horizon. A fishing cormorant attracts our attention, and then to its left, we see what we've been looking for: A fist-sized turtle head lingers at the surface while basking for one, two, three breaths. “Hey, hey! “Ridley at 2 o'clock, 50 yards!” We jolt into action by aiming the bow of our boat to cross the turtle's path. We toss the net floats overboard and drive the boat in a circle, allowing the orderly coil of net lines to leap over the stern as we try to encompass the turtle in our net before it bolts (Figure 1). Then we drop anchor and squint into the glaring afternoon sun until a low spot on the corkline or a waving flipper tip confirms a catch. We tug the net back into the boat, hand over hand, and carefully lift in a net-tangled turtle. A couple of line tugs release the little fella — a juvenile Kemp's ridley that is ready to be stowed on deck in the shade. Our “turtle fishing” for research and conservation draws upon methods once used to harvest turtles, and the traditional techniques are the key to unlock several exciting new purposes. A last surviving generation of west Florida turtle fishermen passed on their knowledge to co-author Dr. Jeff Schmid during his collegiate days of turtle research in the Cedar Keys. 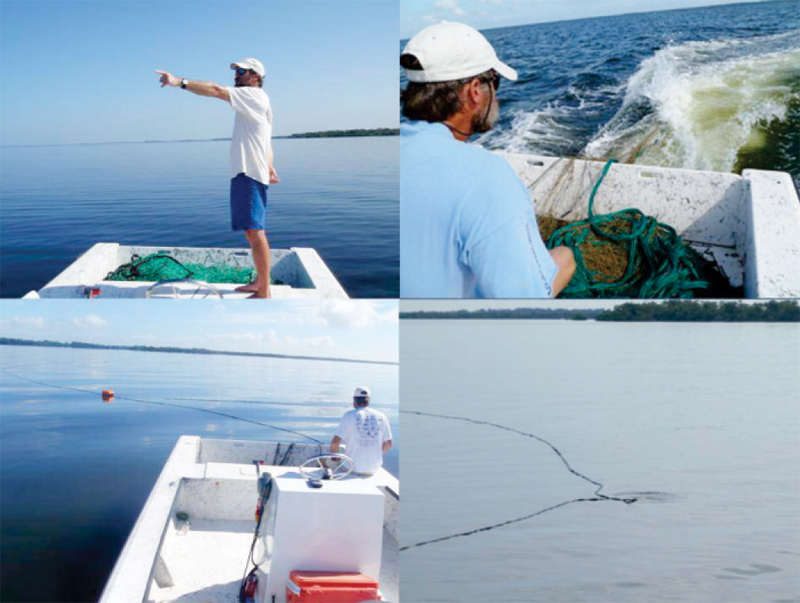 Strike netting from a mullet skiff (a boat with motor in front and net deployed over the stern) was a method that worked well in the murky waters of the Ten Thousand Islands. After some trial and error, the technique was eventually brought into this study in Charlotte Harbor. With a bit of skill and a lot of luck, the turtle is soon brought aboard and gently removed, and the net carefully coiled to be ready for the next turtle. The 2-foot-long turtle in our boat flaps its flippers vigorously for a few seconds and then calms. We continue pulling in the tangled twine that needs a few vigorous shakes to dislodge seaweed.. We log GPS coordinates where we found the ridley, and name it “LK 91” for identification in our field notebook (LK stands for the scientific name for Kemp's ridleys: Lepidochelys kempii. Then we check more closely on the new passenger, which has a couple of barnacles on its snout for character and a film of green algae on its carapace. A thunderstorm is approaching, causing a subtle freshening and shift of wind direction comes with an approaching thunderstorm or cold front, again depending on the season. The chop begins to stack up and makes it increasingly difficult to look for the white head of a Kemp's ridley among the whitecaps. The wind blows turtle grass and bobbing mangrove seedlings into a row on the water's surface. Our radio scanner states a small craft advisory warning of the approaching weather, as the boat starts rolling on its beam. With the turtle aboard, our mission is accomplished, so we turn our boat into the wind and call it a day. The McQueggie is a slow and wet boat because of its flat bottom, so we fetch out rain gear to ward off spray even though the water is summer-ish warm. The boat coasts toward a mangrove-lined channel on the sheltering lee of an island composed of old Calusa Indian shell mounds. We idle past a snowy egret on an arching red mangrove root and into a boat basin. We tie up the boat to the dock, dry our wet gear , and hoist gear boxes away toward the field station. We pump saltwater into a wide blue tub for the ridley's overnight stay at the dock. Our research involves learning what these ridleys eat, so we examine their feces and collect any crab parts or other objects indicating their last meal (Figure 2). We also take a variety of body measurements and weigh each turtle and collect small samples of skin and blood for studies in the lab. We attach ID tags to their flippers or insert a special microchip under their skin — another form of identification similar to the chips used with cats and dogs. ID tags allows us to recognize each turtle if it is found again. Some turtles are fitted with a satellite tag attached to the upper shell, or carapace, allowing us to track their movements after they return to the wild. These research activities, repeated many times, provide a robust sample that helps us comprehend the ecology of young Kemp's ridleys in their underwater domain. We're not the first to go fishing for answers about ridleys. 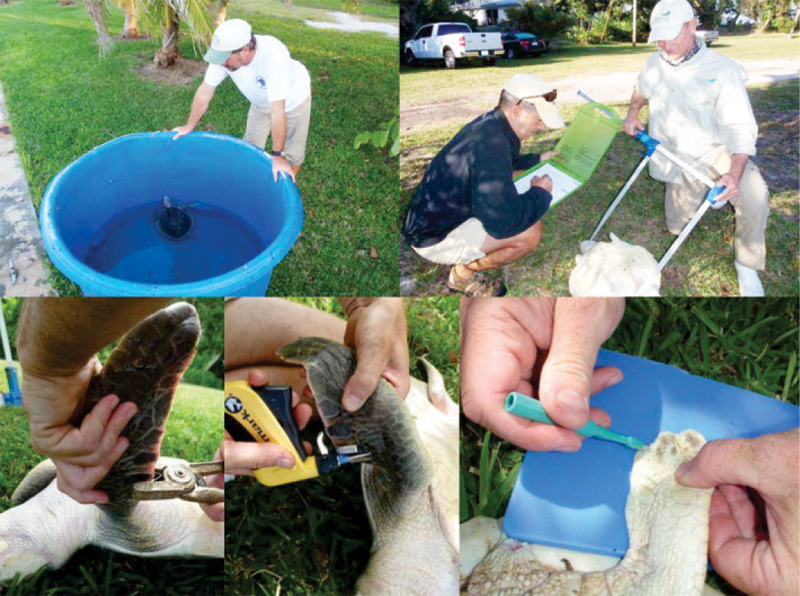 In our previous article, “Ridley Riddles Unravel in Florida,” published in Florida Environmental Outreach Magazine (Vol. 3, Issue 4), we explained how the main nesting beach for Kemp's ridleys, at Rancho Nuevo, Mexico, was filmed for the fist time in 1947 by engineer Andres Herrera, whose rare footage fell into obscurity and was rediscovered by scientists in the early 1960s. We also explored the mystery of why Kemp's ridleys became so scarce. A team of Mexican and U.S. scientists and conservationists discovered that ridleys had declined to near extinction from a combination of egg harvests at the nesting beach and in-water mortality from bycatch in the shrimp trawl fisheries. Once the egg harvests stopped, and the turtle excluder devices, or TEDs, came into wider use to help ridleys escape death from drowning in trawl nets, the stage was set for a recovery – albeit at a turtle's pace. The population has rebounded from a low of 702 nests recorded in 1985 to over 20,000 nests a season as of 2012. Ridleys appears to be out of danger of imminent extinction threats, but are still rare and considered endangered under U.S. federal law. Their history serves as a reminder that human activities can significantly affect sea turtles — and that learning more about these animals can be the key to helping their populations survive and recover. Today, we are working to unravel new riddles about ridleys such as where the immature turtles feed, what habitats they use, what prey they eat and what movements and migrations they make. All these queries must be answered with dedicated in-water studies. A shift from “dullest of fishing” to exciting new discoveries is complete when we combine classic methods of net fishing with modern scientific techniques, many of which were unavailable when the initial ridley riddles were posed by renowned biologist Dr. Archie Carr in “The Windward Road.” (Figure 3) For example, we've begun delving into Kemp's ridley demographics: We've learned that this specific site in Charlotte Harbor hosts three-to-four times more Kemp's ridleys than the other local sea turtle species, loggerheads and green turtles, combined. The ridleys spend their first few years living offshore in Sargassum rafts, and when their carapace, or upper shell, has grown to about 25 centimeters long, they settle into nearshore habitats. From that point on, they spend several more years feeding in coastal zones and estuaries before reaching maturity. We have observed ridleys in Charlotte Harbor ranging in carapace length from 25-cm (known as “post-pelagics”) to 65-cm adults, though the majority are 40-45-cm subadults. By comparing measurements of individual turtles over time, we can determine growth rates that estimate that Kemp's ridleys are probably maturing in about 10-12 years. For example, a tagged turtle we recently recaptured had spent 1.57 years in the wild and had grown 11.9 cm, allowing us to calculate its growth rate at about 7.6 cm/yr. This rate is comparable to that reported in the Ten Thousand Islands for smaller ridley size classes (less than 40 cm). Although this seems a fast growth rate, it may be that the growth corresponded to warmer than average winter water temperatures. We're also learning where these Kemp's ridleys reside (spatial ecology) and how likely they are to be found repeatedly in a given location (site fidelity). We have recaptured several Kemp's ridleys in Charlotte Harbor and all but one were originally tagged at our study sites. 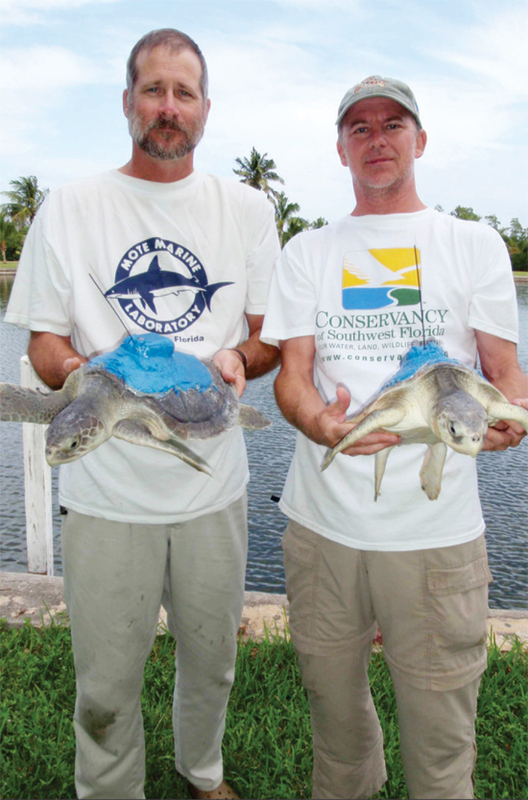 These valuable recaptures provide information on site fidelity and growth, but questions remain as to what the turtles are doing between captures. Basic mark-recapture studies are greatly expanded by tracking turtles with satellite-linked tags to improve our understanding of the turtles' spatial ecology (Figure 4). Our preliminary results suggested that ridleys may remain residents in Charlotte Harbor during unseasonably warm winters. However, we also learned that if water temperatures declined in a particularly chilly winter, these turtles may migrate to warmer waters until water temperature rises again with spring's return. Some larger ridleys shuttle inshore to offshore and back, perhaps preparing for a shift to offshore habitats of adult turtles. Results from this phase of the study are updated daily and available to the public as we track individual ridleys at the seaturtle.org. Real-time satellite tracking can even identify local hazards to turtles such as the impacts in the nearshore zone from harmful algal blooms. Southwest Florida has been affected repeatedly by Florida red tide — blooms of the harmful alga Karenia brevis. One of our satellite-tagged ridleys moved offshore and, unbeknownst to us at the time, swam through an area with moderate concentrations of the harmful algae (Figure 5). A few days later we received signals suggesting the turtle was floating at the surface, before the transmissions ceased. We then overlaid her track on remotely-sensed chlorophyll concentrations, a proxy for red tide, and discovered that the turtle had indeed moved through the epicenter of a bloom off Sanibel Island. Fortunately, the tracks of other turtles suggest they may sense the presence of the harmful algae and try to avoid it. One of our key questions continues to be what Kemp's ridleys eat. This question is more important than ever in the wake of the Deepwater Horizon oil spill, which could have long term effects on many levels of the marine food web, including sea turtles and their prey. 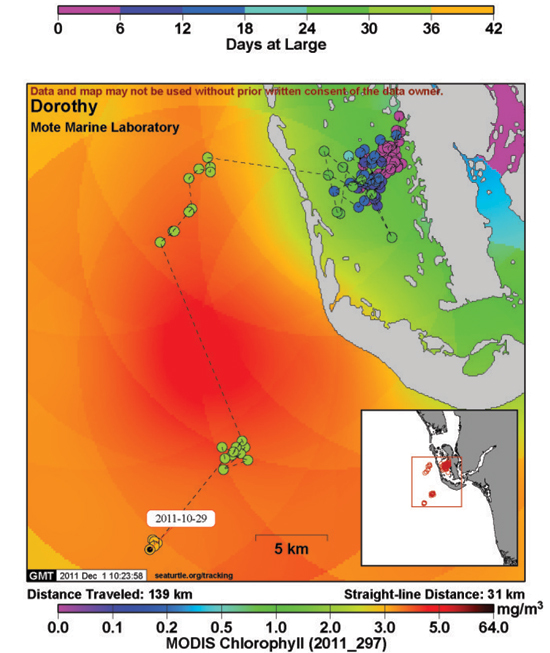 Thought the spill did not reach Southwest Florida waters, it is important to study turtles in this non-impacted area to compare with directly impacted areas. Kemp's ridleys have been studied at numerous places along Florida's Gulf coast in the past, but it is especially important to have long-term studies of their feeding, such as our work in, Charlotte Harbor. The Charlotte Harbor study furnishes an excellent opportunity to learn about the behavior and ecological niche of ridleys. An essential step is to characterize the ridley diet and link those data to the turtles' size, which will help us understand the ridley's place in a marine food web. As mentioned above, we let each turtle in our study swim overnight in a shallow tank of seawater and then collect any feces as the water is changed. The hard parts left behind, such as crab claws and crunched shells, characterize the prey from a recent meal. These recognizable fragments are viewed with a dissecting microscope in the laboratory to identify which prey the ridley ate. 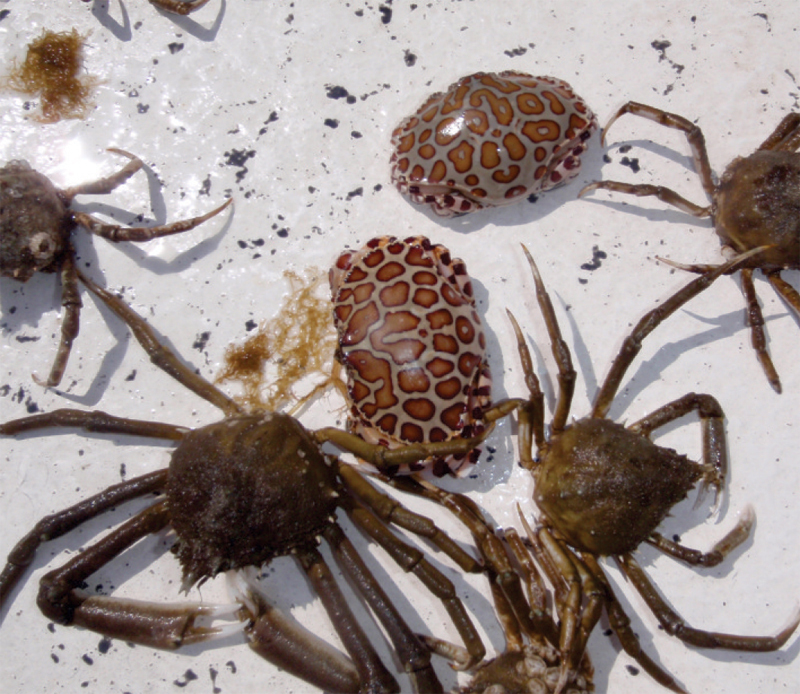 Spider crabs are the primary prey for Kemp's ridleys in Pine Island Sound, although there may be annual shifts in consumption of crab species (Figure 6). Occasionally, when we get lucky, we actually see the turtles feeding on other hard-shelled prey. Dietary studies such as this one act as starting points by which future studies on Kemp's ridleys are able to discern broader, over-arching concepts such as their life history, behavior, and general ecological role within their environment. Determining the idiosyncrasies of this species will help conservation biologists and resource managers begin to construct plans to effectively sustain the natural populations of the Gulf of Mexico's most endangered sea turtle. The Kemp's ridley remains unique among sea turtle species in completing most of its growth to maturity within a single oceanic basin - the Gulf of Mexico. The Gulf's coastal estuaries and near-shore benthic environments are key developmental habitats and host the ridley's food resources. Protection of these areas is vital to the perpetuation of this endangered species. Figure 3. 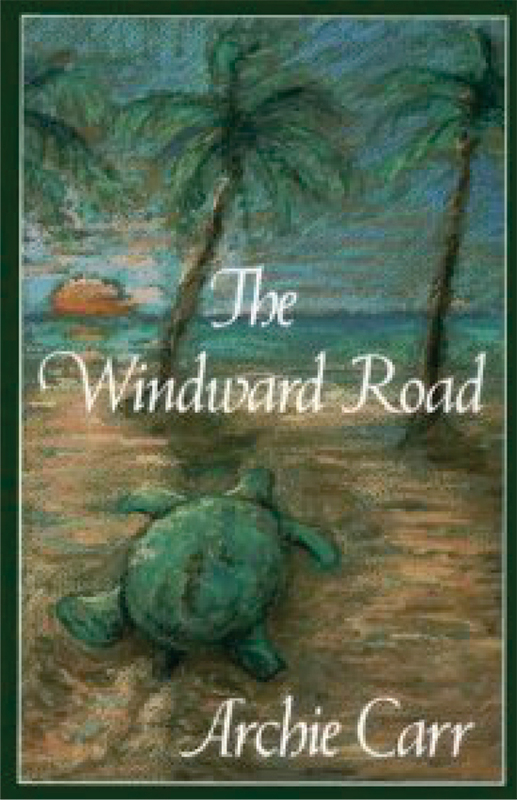 The initial ridley riddles were posed by Dr. Archie Carr in “The Windward Road. Photo by Conservancy of Southwest Florida.